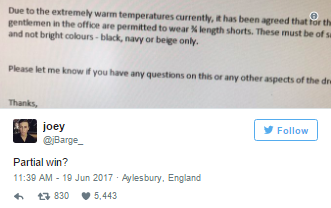 Young man sent home from his career place for wearing shorts in sunny weather goes back to office in his mum's wears..
We've all heard of the heat wave in the UK. Temperatures have soared as high as 34C in London and residents now go out dressed in light items of clothing. A young man tried it to work and was sent back home, so he changed and came back to work, this time, wearing his mother's short wear. 20-year-oldJoey Barge's action was so daring and also so funny but it caused the organization to send their staff a mail, relaxing the dress code to allow the men wear shorts. 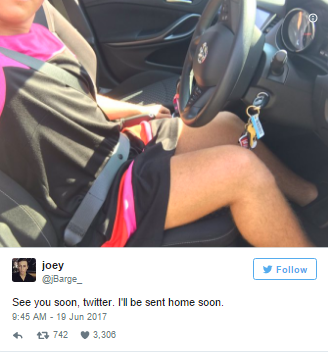 Joey from Aylesbury, England works in a call centre. On Monday, he abandoned his suits and arrived at work in a lovely pair of smart shorts. Joey was not sure if his workplace will approve of his dressing because of their strict dress code but he went ahead with it. 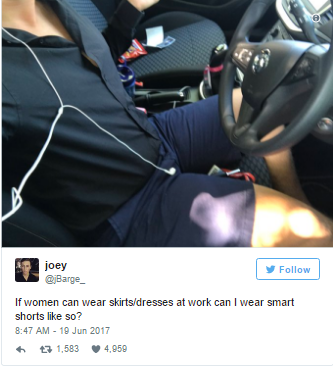 At 8.47am on Monday, he shared a picture of his outfit and wrote: "If women can wear skirts/dresses at work can I wear smart shorts like so?" Less than half an hour later, he had his answer as he was sent home. 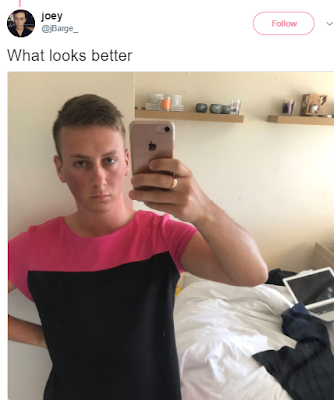 He tweeted: "Answer: nope. Just been sent home from work." Rather than changing into a pair of trousers, Joey took an unusual approach and raided his mum's wardrobe before finding a short wear. 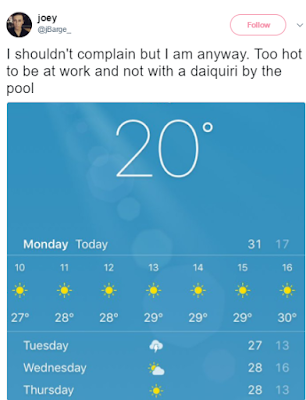 It actually worked in passing his message across and he soon tweeted a photograph of an email he received at work, which read: "Due to the extremely warm temperatures currently, it has been agreed that... gentlemen in the office are permitted to wear 3/4 length shorts."